From time to time Handheld Press goes on the road and sets up our stall at markets, book fairs and conferences. Sometime we travel to give talks about publishing. Here’s a list of future events where we’ll be talking about our books, or selling them. If you’d like us to come and give a talk to your group or your students, or think that your local market might be good with a Handheld stall there, please let us know. 19-21 April: Kate and David will be running the Handheld Press book stall at Ytterbium / EasterCon, Heathrow. Kate will be giving a guided tour of Sylvia Townsend Warner’s fantasy fiction, and we will be launching Rose Macaulay’s What Not with a talk and cakes. 18 May: Kate and David will be at the Alliance of Literary Societies AGM and annual meeting, Nuneaton, with a Handheld Press book stall. 31 May: We will be launching Inez Holden’s Blitz Writing at The Second Shelf, 14 Smith’s Court, London, W&D 7DW, time tba. Ariane Bankes will be in conversation with Kate about Inez Holden and her wartime writing. 2-3 July: Kate will be giving the keynote paper at the conference of the International Elizabeth von Arnim Society, Toulon, France, and previewing our reublication of that excellent author’s great comic novel The Caravaners (16 September). 14 July: Kate will be running a workshop on pitching your book to a publisher at the Frome Festival. 17 July: Kate will be giving a talk at Aberdeen Central Library about Handheld, publishing, and how to get published. 24 July: Kate will be giving a talk on publishing from the inside at the Shetland Library, Lerwick. 3 August: Handheld will have a book stand at the Exeter Small Presses Day at the Custom House, an initiative of Literature Works South West. 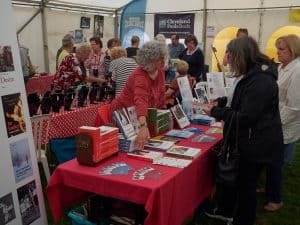 14 September: Handheld will have a stall at the Bathampton Village Show. 18-20 October: Handheld Press will have a book stand in the Dealer’s Room, and will launch our republication of Vonda N McIntyre’s The Exile Waiting at FantasyCon, Glasgow. 26 October: Handheld Press will be at BristolCon, in Bristol, selling our fantasy and science fiction, and launching our new collection of vintage Weird fiction, Women’s Weird.